Back in 2007, I first drove a new Subaru WRX in World Rally Blue. It was the first Subaru I've ever driven, the first turbo car I've ever driven, and the first fast car I've ever driven. I remember that day like it was yesterday. The salesman handed me the keys and said that I only have 10 minutes, not a second more. I pulled out of the dealership and immediately got into a traffic jam, sitting there for what seemed like an eternity as my time with the car continued to evaporate. I was so angry with the situation that as soon as I saw a clearing, I put it into first and floored it... The revs climbed quickly to three and a half thousand, and as soon as the turbo spooled up, the world went all blurry, my back was welded to the seat, and I hit the rev limiter in what seemed like a heartbeat. That moment was the moment when I fell in love with the 07 WRX, and I knew I had to have one some day. I couldn't afford it at the time, but the thought of it was tattooed on my brain forever. Since that day, I've been fortunate to drive a lot of very different and very fast cars - an e46 M3, a Caterham, a 240SX with a massive turbo, a C6 Corvette, heavily modified Miatas, even some very fast Subarus. All cars that would absolutely embarrass a stock 07 WRX in a straight line and around a track. But I never forgot the feeling I got when I drove the Subaru. Once I graduated from university and started making a little bit of money, I started looking for that 07 but clean ones were very hard to come by and the few that were clean were prohibitively expensive. I thought I'd wait it out, give them time to depreciate. But as time went on they became even harder to find. Sure there were other Subarus for sale, I've driven some, even owned some, but I felt no excitement for them. Must sound funny from a guy writing a blog about his 02 Impreza Wagon. Don't get me wrong, I love having that car and the fact that it allows me to drive rallycross events on a very modest budget without caring about scratching its paint, it even puts a smile on my face from what it can do, but I could never sit and stare at it, enjoying the sheer thought of owning it. I almost gave up on the search entirely, but this year, seeing a couple cars go up for sale that might fit the bill the spark was re-ignited and I seriously started looking for one again. When I mean seriously, I mean - setting up alerts on classifieds sites, calling dealerships to let them know I'm searching, putting up "wanted" ads, and checking every conceivable resource several times a day. Couple cars came up that looked very interesting on paper, but when I showed up to look at them I realized they were barely worth scrap money. One car was being sold as "mint" and having a clean carproof - when I showed up I immediately saw that it was involved in a very, very bad accident and repaired cheaply off the books to keep the carproof clean. Didn't even bother test driving it. Another car I looked at seemed very clean, with the only issue being the wrong colour and a replaced bumper cover due to it being rear-ended. I almost bought it despite its faults, but the carproof revealed much more damage than the seller advertised, so it was a no-go as well. I came back from this viewing feeling pretty down, realizing that even the cars that seemed clean on paper and were selling for considerable amounts of money were very far from what I was looking for. 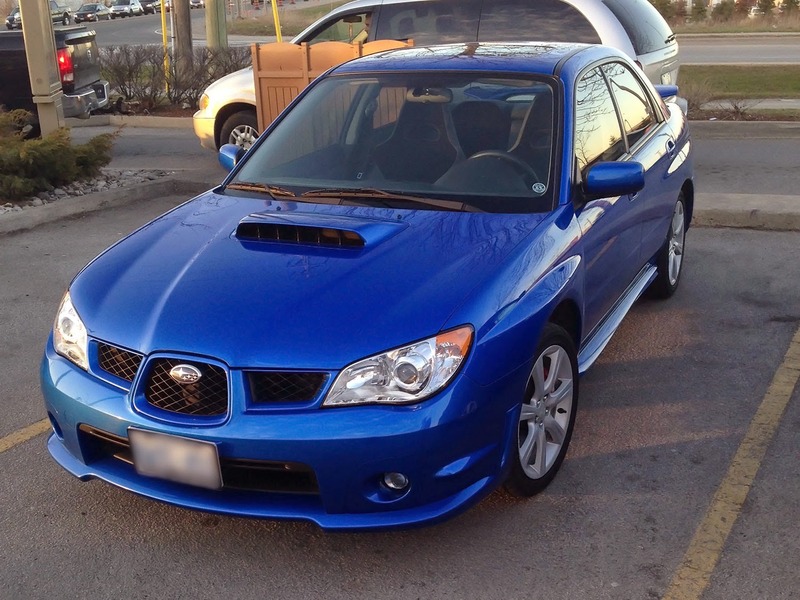 I was ready to give up on my WRX obsession - fired up Kijiji with a friend, put in the only requirement as my price range and a manual gearbox, and waded through hundreds of ads for cars that did absolutely nothing for me... and then out of nowhere, I see an ad for an 07 WRX with no details except a link to a page on the Budd's Subaru dealership site. I open the page, and my jaw drops as I see the car I've been dreaming about for 8 years - exactly the same as the one I drove in 07, with 77,000 kms, full service history, one owner, no modifications, and not a single scratch. It was only posted two days ago, still I had no idea how I missed it. I sent the dealership an email, and decided to wake up bright and early to give them a call as soon as they opened, and schedule a viewing. The next morning I woke up to find the ad had been taken down. My heart sank. Sure enough, I called them and they said that they had never seen an 8 year old car as clean and well taken-care of as this one, not to mention that the owner was a 71 year old woman who serviced it above and beyond what was required, and didn't even winter drive it. The car was sold within 2 days on the market. I was floored. On the one hand it gave me hope that clean 07 WRXs may still be out there, but on the other I knew that I will never find a car as clean as that one and all cars I see since will pale in comparison. Since that day, I decided to expand my search criteria. Yes I really wanted an 07 WRX, but maybe, just maybe, getting another interesting Subaru would satisfy that craving. I had a look at an 01 RS, an 04 WRX, and a few others. They all had flaws, and none appealed to me in quite the same way, so I didn't even put in an offer. Two weeks passed and I pretty much gave up on my search, except that I was still checking ads for WRXs on my phone every few hours - more out of habit, than because I expected to find anything. 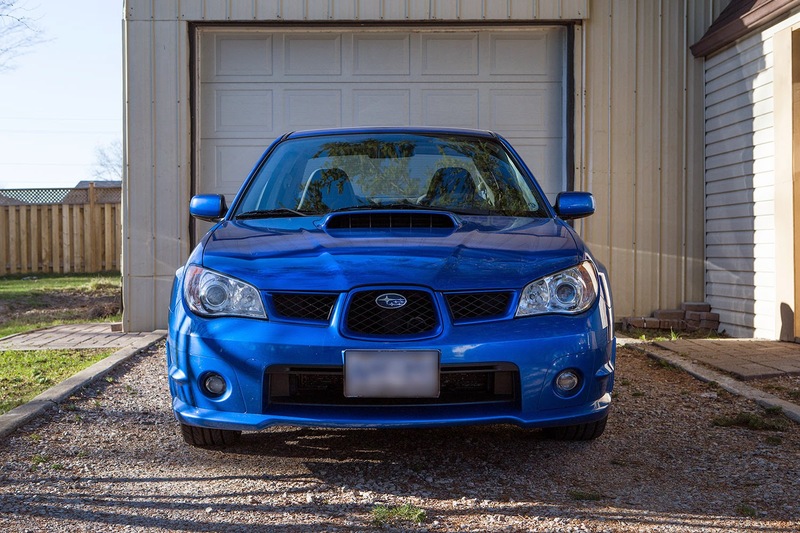 Then all of a sudden - a perfect, clean, unmodified, blue 07 WRX pops up, posted just 3 hours ago. I message the seller immediately, and imagine my surprise when I realize that it's the same car that sold at Budd's Subaru! After owning it for just two weeks, he encountered some financial troubles and had to sell his toys, including the WRX he just bought. I was thrilled, and scheduled a viewing at the earliest possible date. I knew this was the car, I knew I was the first buyer to look at it, I knew I was going to buy it the minute I see it, and that my dream will finally come true. I tried to contain my excitement so as not to be disappointed if anything turns out wrong with the car, but I couldn't. However, all those hopes came crashing to the ground when the seller emailed me on the day I was to look at the car, apologized sincerely and said that he just could not let it go. It was just too rare a car to pass up, and despite his financial troubles he would try to make it work somehow. I understood of course, but it was painful to see that car get away from me for the second time. He took the ad off Kijiji, and that was that. Except it wasn't. An hour later I got another email from the seller apologizing for the back and forth, but saying that he really doesn't want to but he has no choice but to sell the car, and if I'm still interested I can have a look at it as promised. I should've been thrilled, but I actually felt sorry for the guy - having to sell a car he clearly loved just two weeks after buying it. Regardless, I confirmed the viewing and went to see it. Even when I drove up and saw it in person for the first time, I continued to be skeptical. But after looking over every panel gap, every nut and bolt, every typical rust spot and finding absolutely no flaws I was ecstatic. The only thing keeping me from jumping with joy was the sad look on the seller's face as he sat on his porch, watching me go over the car, realizing how serious I was about buying it. It was a bitter-sweet moment indeed, but within less than an hour we made a deal and proceeded to do the paperwork. I have never dealt with a more straight-forward and honest seller when buying a car - every question I had was answered with an honest, detailed answer, he promised to keep his insurance on it until the day I get my policy, and even left a screwdriver in his mailbox for the license plates when I came to pick it up. I got my new plates, and came out to pick it up the next day. My dream car of 8 years, finally mine. Have you ever had an inexplicable love for a car that you just had to have? Did you find one in the end, or are you still searching? Share your story in the comments! p.s. I know this post was a bit off-topic but I just had to share that story. Regular content on the RallyWagon driving sideways, wallowing in mud and spraying up gravel will resume shortly. Thanks William! It's no wonder they hold their value seeing how difficult they are to find in good condition. Plus many people agree that the hawkeye was the last WRX that was a true "driver's car" - since then they've gotten bigger, softer, quieter. They've gotten to be better cars no doubt, but they seem to have lost the soul of the WRX.